The month of August is showing its habit of being a wild month for stock trading. And the head honcho of the Old Gods, Jupiter, has now changed signs ... moving from extroverted Leo into the far more discreet and discerning symbolism of Virgo. 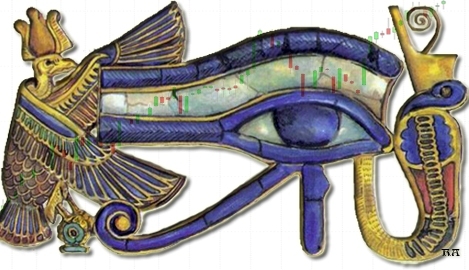 Jupie loves the Fire signs, especially Leo, which is associated with gambling and speculative profits. The symbolism of Virgo is much more picky. It always want to see the evidence on the books ... books attended by accountants and subject to nit-picking auditors. We should see an accelerated shift in support for some sectors and a withdrawal from others. Since Virgo rules health stocks, it might be worth studying those charts more closely than usual. On Wall Street, the Dow Jones Industrials have been in downtrend mode since May, but the Pollyanna index has been bouncing around in a trading range for all of 2015. Astrologically, we have a couple of major events. This weekend has Venus, the ruler of money and material wealth, in the middle of its current Retrograde phase. I'm going to concentrate in this edition on the position of the Australian stock market ... with a quick look at the SP500 and the DAX. 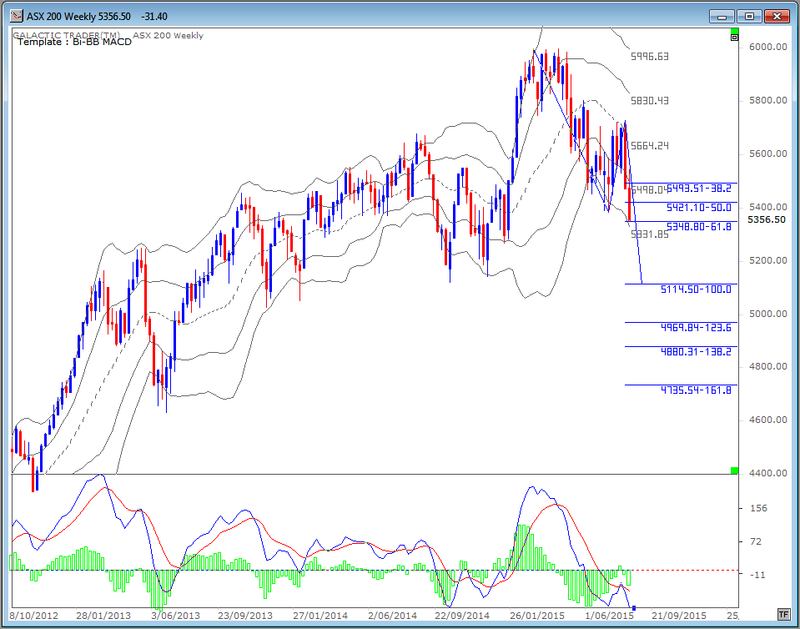 In the last edition on July 13, I published the following chart and warned the ASX 200 was heading into a major hurdle. It was a major set of downtrending inner planet lines ... Sun, Mercury, Venus and Mars ... which had a strong track record of sending the index into a dive. I said in that edition: "The trouble will come if the index rises into around $5700 by the end of the month." And this is what happened. On August 4, two trading days after the end of the month, the ASX 200 hit a momentary spike high of 5727 ... and then its wings fell off. Which brings us to the potential good news. On the chart above, I've now included a set of rising primary planet lines. As we did last time, take a look over on the left of the chart. 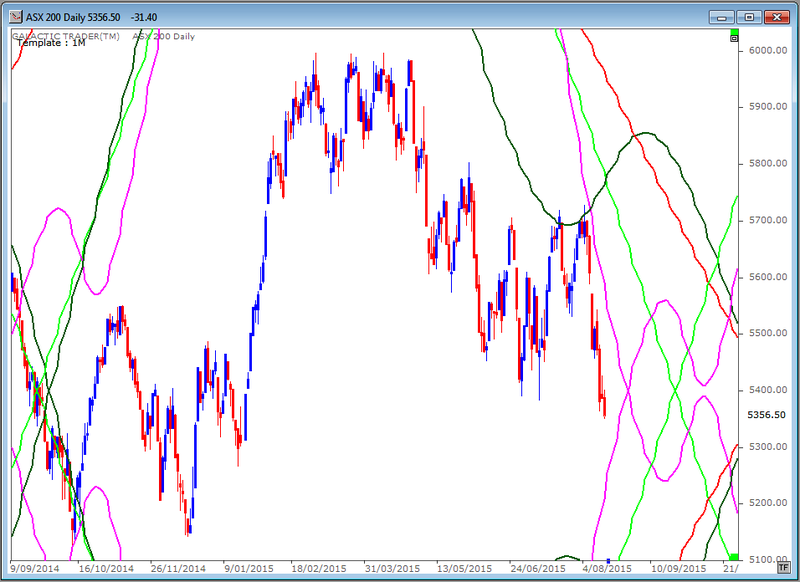 The ASX flopped down until it made contact with a rising (pink) Mercury line ... and a new one of those is now very close to the current price action. There's no certainty the rising Mercury will be strong enough to change the downtrend back into full-on rally mode, but we can use some other techniques to get a sense of where the drop will stop. Firstly, let's take a look at a weekly Bi-BB chart. The use of Bi-BB charts is outlined in The Technical Section of The Idiot & The Moon, and is one of the two most strongly-recommended techniques for trading safely. The first thing to take note of is the distinctly higher trough developing in the histograms of the fast MACD oscillator ... positive divergence. The second is the projection being made by the Fibonacci extension tool. A corrective downtrend tends to make what Elliott Wave analysts describe as an ABC pattern, where A is the first wave down, the B is a bounce, and the final downleg is the C wave. We appear to be well into the C wave. It is not at all unusual for the C wave to be some level of Fibonacci projection of the A wave. 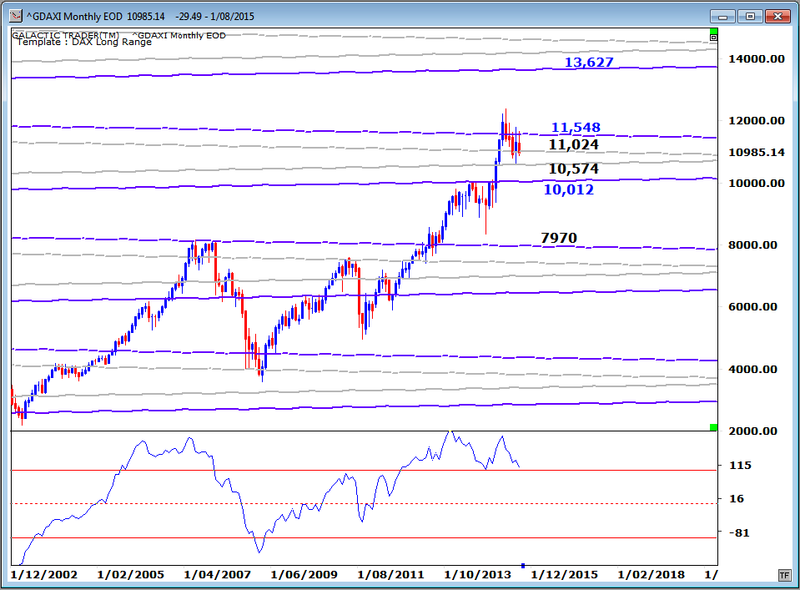 The index ended last week with a touch of the 618 extension of wave A. 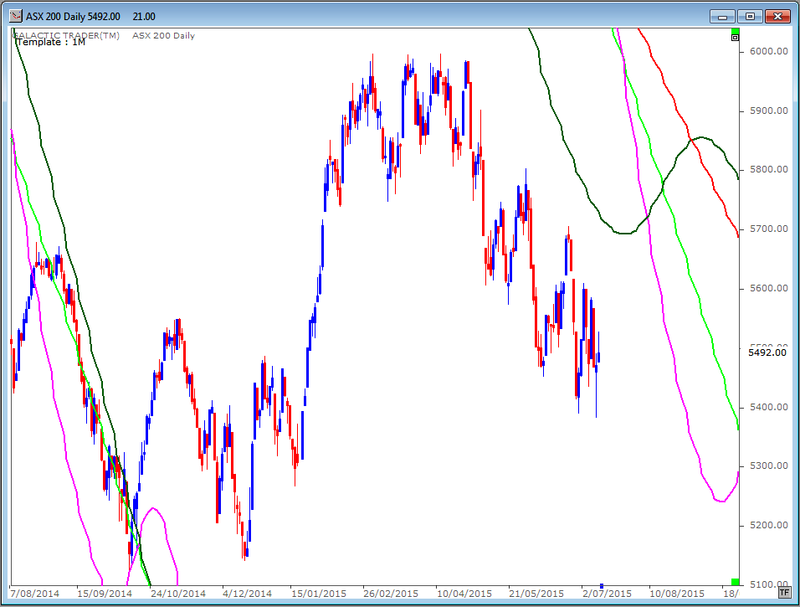 Often A and C are close to the same length and if that holds true this time, the ASX is headed to the 5100s before either a major uptrend, or even a resumption of the overall Bull trend, starts. We have a couple of alternative price targets to watch using Auntie's Weekly Planets chart, which most of you are now thoroughly familiar with. Our Big Bird oscillator is in a dive, strongly suggesting there is more downside to come before a reliable and safe bounce can take hold. Traders should be very cautious if any bounce in the next week or two cannot close decisively above those two blue Saturn lines which have just failed to hold the price lows. 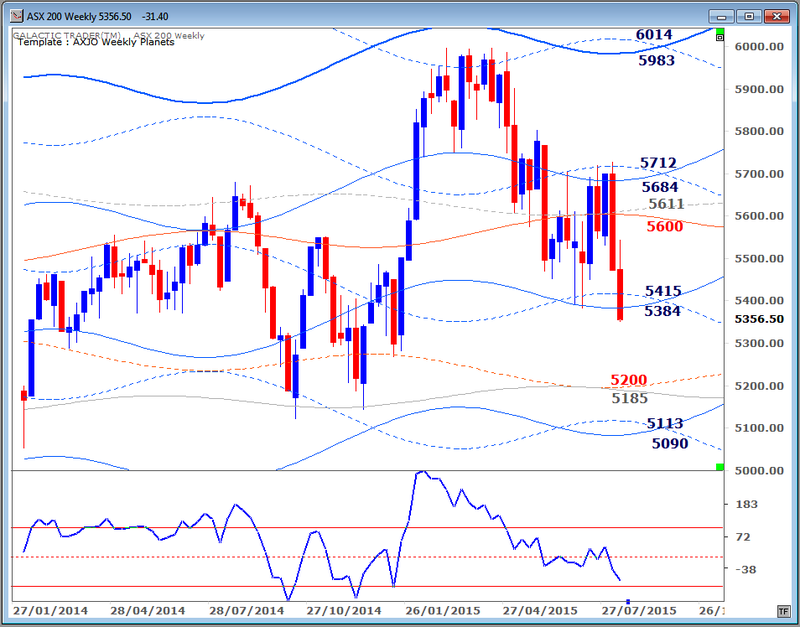 The price levels around 5200 and 5100 should also be monitored for bounce potential should the decline continue. Turning now to the SP500. I went into its position at some length in the July 13 edition and not much has changed, so you can have a look at that report in the Archives if you need a refresher on the price targets to watch. We are on the verge of getting a preliminary sell signal using the monthly Idiot chart. 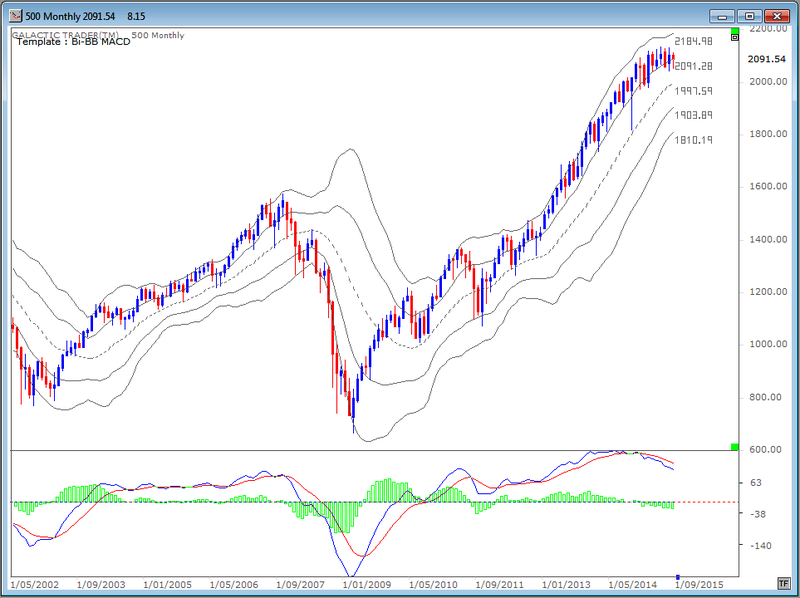 Pollyanna is still trying desperately to hold the upper tier line on the monthly Bi-BB chart, but both the fast MACD signal line and histograms have gone negative, so traders do need to be really cautious opening new Long positions on the 500. Germany's DAX continues to be Europe's outperformer, but it is also into a multi-month correction. The chart below is its long-range planet price chart. It's playing inside a Pluto/Neptune price zone ... and it has a history of doing so. It occurred during the 2007 Bull peak and the 2009 Bear bottom. There is much talk about the woes of the Australian market being heavily under the influence of how China is going. It's an easy explanation for the talking heads, who seem to overlook the fact that Australia didn't soar with the eagles when Shanghai went into a major Moon shot this year. I'd rather trust the planets! And the Idiots. Long story short ... if Auntie goes into bounce mode shortly, hitching a ride on the rising primary planet lines, so too will the other Western indices.